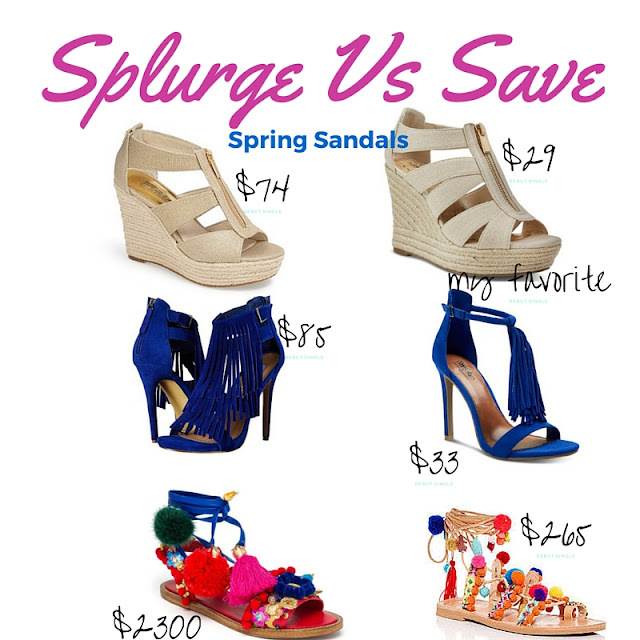 Cait's Cozy Corner : Save Vs Splurge Sandals! Hello! I'm so excited to be guest posting for Kate and sharing my favorite accessory about spring; sandals! Of course this spring there are so many amazing design and style so I've narrowed it to down to my top 3 favorites that I'm most anxious to pair with some great outfits. As always with shopping, there are items that you just have to get but then there are also ones where you can save a little bit of money. I'm always trying to find a good bargain, especially with trends like these. Save: Target Wedges. Target Blue Heel. Pom Pom Sandals. What are you loving to save and splurge on this spring? Seriously, the budget friendly sandals are the best looking ones love it especially the blue shoes!